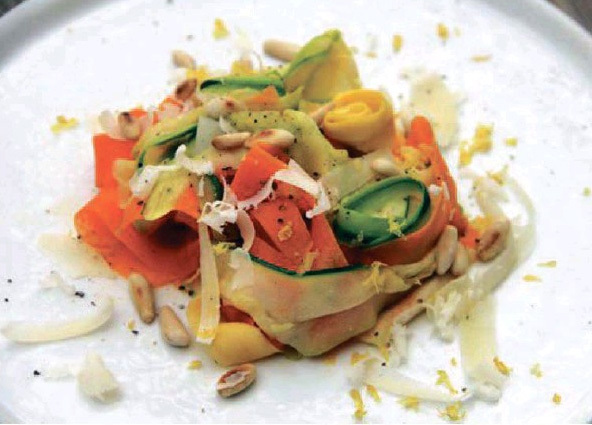 This recipe for Paleo Sautéed Vegetable Ribbons in Olive Oil and Garlic is a revised version for Sunshine Ribbon Vegetables, found recently in our local Sunday newspaper. My first attempt at this recipe was spur of the moment and so didn’t have all the ingredients required. I didn’t have the yellow squash, and had only two-thirds of a zucchini. But I had plenty of carrots and used two medium. I used a vegetable peeler to make the ribbons. I may try my kitchen mandolin the next time. The ribbons came out a little thicker than the original recipe suggested. But, not a problem. The thicker ribbons seemed more hearty. I merely had to saute them a bit longer to get them al dente. I served the ribbons with freshly ground pepper and shredded Parmesan cheese. Delicious. I will definitely be making sauteed vegetable ribbons again. As for the revisions, for simple Paleo clarity I replaced the original “olive oil” ingredient with the more healthy extra virgin olive oil (EVOO). Also, with the garnishes, I noted that Parmesan cheese, as is all dairy, is not apart of the strict Paleo diet. However, if you follow the Paleo 85:15 rule (see below), as I do, then help yourself. Finally, the original recipe called for lemon juice in the saute and lemon zest as a garnish. While lemons are Paleo, they were not used because of my wife’s on going skirmishes with intestinal Candidiasis. *Pine Nuts can be expensive. You can substitute less expensive sunflower seeds, toasting them the same way. Heat the EVOO over medium heat in a large sauté pan. Add the garlic and sauté for one minute, until fragrant. Add the vegetable ribbons, salt, lemon juice (optional) and stir. Cover with a lid for 1 minute (or longer for softer ribbons or if your ribbons are thicker). Remove the lid and remove from heat. Combine oregano, basil, parsley, and thyme in a small bowl. Sprinkle as much as you like on cooked vegetables or toss with raw vegetables prior to roasting. Place remaining blend in an air tight container and store in a cool dry space.